The Legendary Starfy's interface is pretty easy to navigate, but could be a little easier. The one minigame that's available to play without needing to unlock it ("Coin Slinger") still requires the host to go through the initial game introduction and first level before it's made available. The Minigames are located within the save file, which makes sense because they (mostly) have to be unlocked by playing through the game within that file. 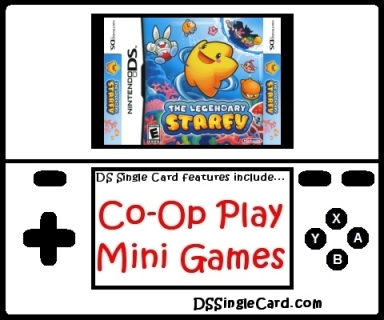 The Co-Op With Starly is accessed from within the area that will be played. Download time is a little longer than most other games with similar content downloads, but it's not ridiculously long. The length of the opening credits is average. Overall, the menus functioned well. The touch sensitivity was accurate, with clearly defined borders and some buffer space (but not a lot). For the Co-Op With Starly, the controls are button-based, so there aren't any accuracy issues. Also, the vast majority of the controls are mapped onto two buttons ("B" and "Y"), so forgetting which button to hit results in a one-in-two chance of hitting the right button during a forgetful panic. For the Minigames, the controls are based on the stylus and the touch screen. There were also no discernable problems with the Minigame's controls, since the controls were mapped specifically for each of the Minigames, and not adapted from another action. Graphically, The Legendary Starfy is a 2D game, but the background shows depth and some of the foreground items seamlessly feature 3D elements to them. The colors are mostly bright and welcoming, but change stage-by-stage to fit the stage's mood. Audibly, the music adds to the mood of the game, and it's not essential. The sound effects, on the other hand, are pretty important (particularly in the Co-Op With Starly), letting layers know what's going on around their character and letting them know if they succeeded (or failed) in their attempt to complete a particular move. Feature-wise, there are four Minigames that support up to four players each, and Co-Op With Starly allows a second player to join in for parts of 21 levels (out of 56 levels in the first 8 basic Stages). While, that's a lot of different parts of the game to check out, the game will auto disconnect the guest at the end of a level segment when the Co-Op With Starly is no longer available, and without a warning and a "back up" option. The variety of content in Co-Op With Starly does a great job of really giving guests an idea of what the game offers. Offering downloadable demos of specific levels, parts of levels, and/or the Minigames would have been a nice touch, though. I generally go into a review of a Nintendo-published title expecting a certain level of quality and content, and The Legendary Starfy didn't diappoint. New to North America, The Legendary Starfy is actually Starfy's fifth game (the first four were released only in Japan). For people unfamiliar with The Legendary Starfy, the best way I can describe it is a cross between Mario's platforming and Kirby's attitude and game style. If you like Mario games and Kirby games, you'll like Starfy. The game is well put together, with a unique art style to the characters and to the gameplay. In a normal review, I fully play through everything pertaining to the Single-Card Download portions of the game, but not always the full game itself. Looking around the Internet, I couldn't find a single site that had all of the Minigame unlocking information (meaning that DSSingleCard.com will be the first). I also didn't find a complete list of areas where Co-Op With Starly was available. Because of this, I played through the entire game, and played for five or six times the amount of time I usually spent. And it was very enjoyable. On to this specific game itself: The Legendary Starfy has some great Single-Card Download content. The ability to test out almost two dozen levels, and play four Minigames. Playing through the level segments comes across as a bit of a tease. While, yes, it makes you want to go and buy the game, it adds almost an equal amount of frustration, in that you never really get to finish anything but the bosses, and you don't get to start most of those levels. While playing through the Co-Op With Starly, I found that Starly could do several moves I wondered why Starfy didn't (ex: wall jump). The Minigames are fun, and keep with the game's personality and attitude, but don't represent basic gameplay; they're there just to be fun multiplayer gaming. They do, however, have a beginning and an end. Overall, the Minigames are fun and the Co-Op With Starly is a lot of content, just a little at a time. The game is fun, and (reconnections aside) will provide you with plenty of content, and you'll be playing for quite a while if you want to test it all out. The game is fun. The different parts of the experience have differing levels of fun, but it's all fun. Make the Minigame "Coin Slinger" available without having to play through the first level. Warn the host and guest before the guest will be disconnected in Co-Op With Starly and let the players go back to avoid disconnection if desired. Offer downloadable demos of specific levels, parts of levels, and/or the Minigames. Click here to return to the DSSingleCard.com The Legendary Starfy profile.